Charlotte - The hospital in Liberia where three American aid workers got sick with Ebola has been overwhelmed by a surge in patients and doesn't have enough hazard suits and other supplies to keep doctors and nurses safe, a missionary couple told The Associated Press on Wednesday. The latest infection — of Dr Rick Sacra, an obstetrician who wasn't even working in the hospital's Ebola unit — shows just how critical protective gear is to containing the deadly epidemic, and how charities alone can't handle the response, they said. Nancy Writebol and her husband David called for reinforcements during the AP interview, which followed her first news conference since recovering from Ebola disease. They work for North Carolina-based SIM, the charity that runs the ELWA hospital in Monrovia, Liberia. About 250 staffers at the hospital use thousands of disposable protective suits each week, but that's not enough to fully protect the doctors and nurses who must screen people entering the emergency room or treat patients outside the 50-bed Ebola isolation unit, they said. "We don't have enough personal protective safety equipment to adequately be able to safely diagnose if a patient has Ebola. So they are putting themselves at risk," David Writebol said. Sacra, a Boston-area obstetrician and veteran of many tours in Africa, felt compelled to return to Liberia about a month ago despite these challenges. As soon as he heard that Dr Kent Brantly and Nancy Writebol were sick, Sacra called and said "I'm ready to go," SIM President Bruce Johnson said. Sacra's job was to deliver babies at the hospital and take care of patients who were not infected with Ebola. He followed all the protocols to protect himself, said Will Elthick, the group's operations director in Liberia. But Sacra got infected nonetheless by the virus that has killed more than 1 900 people and sickened 3 500 in five West African nations. 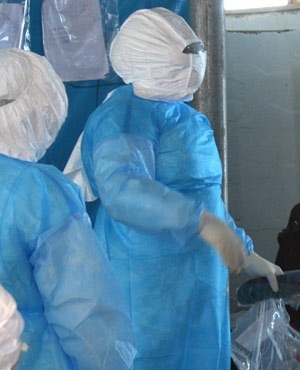 The disease is spreading faster than the response in part for lack of protective gear, said Tom Kenyon of the US Centres for Disease Control and Prevention. At least $600m is urgently needed to provide these tools and extra hazard pay so that more doctors and nurses are willing to risk their lives, the World Health Organisation said on Wednesday. Health care workers at other West African hospitals have gone on strike demanding more protections, the Writebols said. "They are saying, 'I can't go to work safely until there is personal protective equipment available — the right gear, the right procedures in place. And then, if they don't go to work, are they going to get paid?" David Writebol said. The Writebols are veteran missionaries in Africa; David helped with the hospital's technology while Nancy helped dress and disinfect people entering and leaving the Ebola unit. They say the challenges are far bigger than what any one hospital can handle alone. Liberians were already struggling to survive before Ebola, and now it's even more chaotic, they said. The numbers of patients are surging, and finding food and supplies is more costly and difficult since airlines stopped serving the country. Ebola has "overwhelmed the supply chain," David Writebol said. "They can't get equipment in because there aren't any regular flights coming in. Same thing with aid workers from the international community. There are only a limited number of seats available to come into Liberia. ... That's one of the biggest problems — getting medicine, protective gear and supplies for health care workers who are there." Nancy Writebol said the emergency room is often where patients would show up first, and people showing symptoms were ushered into triage. But health workers were sometimes exposed as they screened these patients, who may not have known or advertised that they were carrying the virus. And sometimes, the sick would leave before finding out if they had Ebola. "Those are the people you really worry about going back into the community, because if they are sick with Ebola, it will ultimately spread," she said. Sacra immediately got tested for Ebola after coming down with a temperature, his brother Doug Sacra told the AP. Like his colleagues he also went into isolation to avoid spreading the virus. Some other doctors haven't been so rigorous. The WHO announced today that a doctor in southern Nigeria was exposed by a man who evaded surveillance efforts, and then in turn exposed dozens of others by continuing to treat patients after he became ill. Then he died, and his family and church members followed their funeral traditions by laying their hands on his body. Now his widow and sister are sick and about 60 others in the city of Port Harcourt are under surveillance. Sacra, who left behind his wife and three grown children for this latest trip to Africa, was in good spirits on Wednesday and able to send emails, Elthick said, which could mean that he's physically well enough to be evacuated. His wife, Debbie, said in a statement that she's focusing on her husband, but she said "Rick would want me to urge you to remember that there are many people in Liberia who are suffering in this epidemic and others who are not receiving standard health care because clinics and hospitals have been forced to close. "West Africa is on the verge of a humanitarian crisis, and the world needs to respond compassionately and generously," she said.